Portraits heads to New York! PORTRAITS hops over stateside to take part in the first ever Dumbo Film Festival in Brooklyn, NY! Feel The Reel IFF selects PORTRAITS! Thrilled to announce that Portraits has been Officially Selected by Feel The Reel International Film Festival! An excellent way to kick off 2019. Pleased to share the news that the full Portraits anthology has been Officially Selected for the 2018 Direct Short Online Film Festival. Amani and Hatty have decided to focus on their individual projects so from now on this site will focus on Amani’s future work, as well as hosting her previous projects made under the HeavyWait banner. We hope you enjoy the new site! Check out the brand new poster for PORTRAITS! Photo credits from top: Amani Zardoe, Jessica Sîan, Lara Sawalha, Hatty Jones, Diany Samba-Bandza. Check out the trailer for our Portraits anthology series! Visit the work page here for more info on the team. You can now watch Amani's award nominated film, Miss J, online here. The first three episodes of our anthology series "Portraits" are currently working their way through post-production, while we prep quick-turnaround shoots for our next two episodes! Watch this space. Sneak peak film still from this weekend's shoot! A surreal gem written by Maud Dromgoole & performed by Diany Samba-Bandza. We're thrilled to be screening Miss J at a *special* one-off Christmas event, hosted by TAPE X & UNDR LNDN! See you Upstairs at the Ritzy in Brixton this Saturday 9th December at 3pm for a line up of Incredible Shorts! Book your *Free* ticket here. Check out the first review for Miss J by online blogger & reviewer Stick with the Indies here. Don't forget! 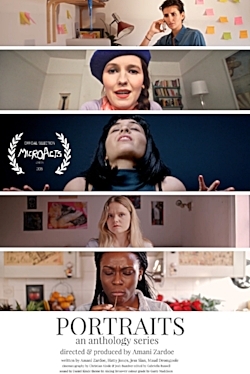 You can watch Miss J on the big screen alongside a fantastic line-up of emerging female filmmakers' work at this year's BAFTA qualifying Underwire Festival. More info here. Wrapped our second "Portraits" shoot: "Portrait Of A Fighter", written by Hatty Jones, performed & directed by Amani Zardoe. Cinematography by Christian Kinde & Sound by Daniel Kinde. Miss J nominated @ Underwire Film Festival! We are so pleased to announce that Miss J has been nominated for the Writing Award at the brilliantly awesome Underwire Film Festival 2017! Film still from our new anthology series 'Portraits'. Excellent shoot today with dream team Christian & Daniel Kinde! We're excited to announce the title of our forthcoming collaborative project: PORTRAITS. A series of short monologue films exploring the self we project to the outside world - and our true, hidden self. Heated brainstorming session for our new project, excited to have new collaborators on board - proper writer's room up in here. First public reading of 'That Girl' at The Cockpit's sold out New Stuff night.